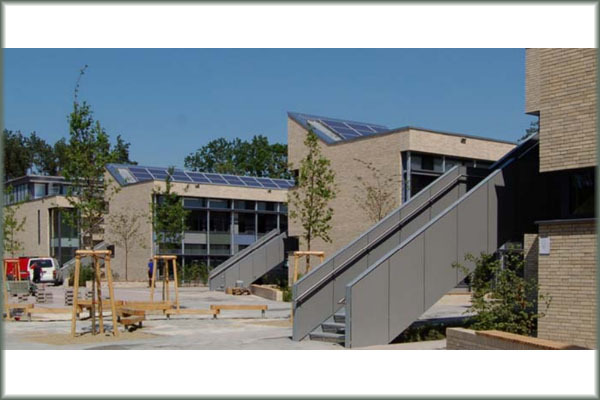 Niederheide Primary School in Hohen Neuendorf near Berlin is the first school in Germany to be awarded the Gold Medal for Sustainable Construction by the German Federal Building Ministry. 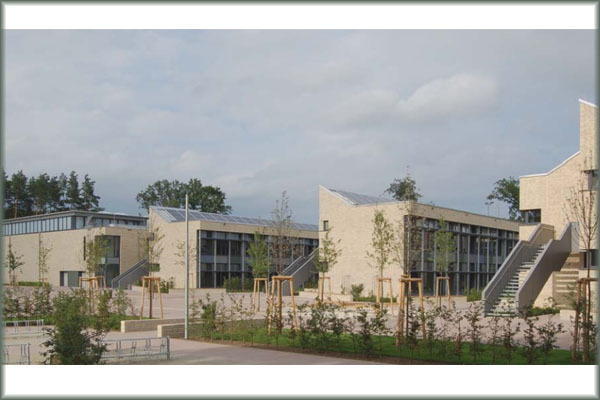 Germanys first new build energy-plus school building is based on an integrated design approach that provides excellent learning conditions regarding spatial quality, air quality, thermal and visual comfort. The main technical features are the highly insulated passive house standard followed in the project, a newly developed hybrid ventilation concept, use of renewable energy sources and the integration of innovative building components. The classrooms are oriented to the south. This enables efficient solar shading, natural lighting und passive solar heating. 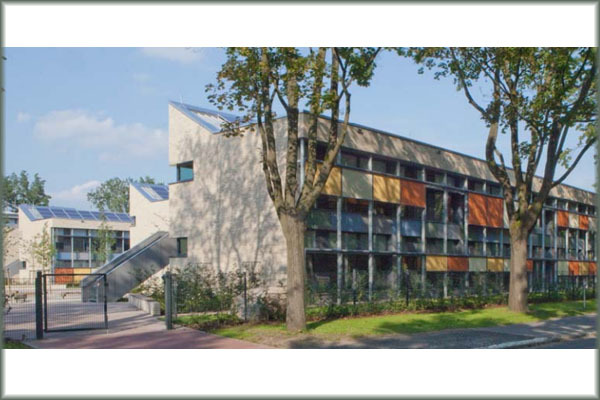 Facade designed to provide efficient solar control, natural lighting und passive solar energy gain. Ventilation strategy is based on achieving a good balance of thermal comfort, air quality, user acceptance and energy efficiency. A combination of natural and controlled ventilation is used by grouping the classroom with a sanitary unit. 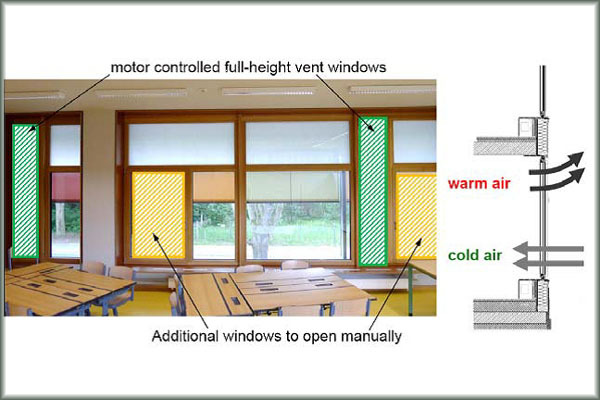 Ventilation of the classrooms is primarily achieved by a rapid natural ventilation during the breaks using motor controlled full-height vent windows. Natural ventilation is combined with a small mechanical ventilation system for reducing high CO2 levels etc. 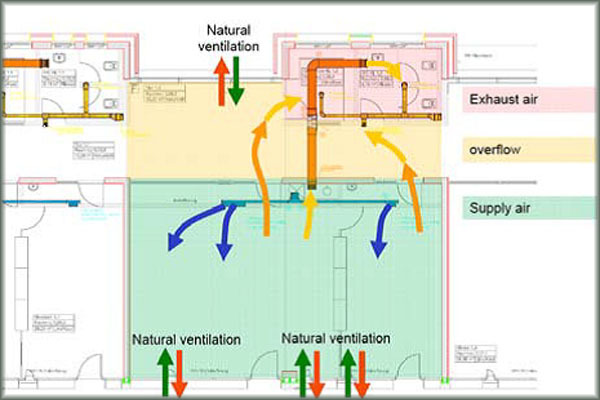 The supply air flow for the classrooms correlates to the amount of the exhaust airflow needed for the sanitary units. Indoor thermal comfort in summer is achieved by means of night cooling using the motor controlled vent windows. Large areas of thermal storage mass are cooled using night cooling. Classroom facades are oriented south to provide sufficient solar shading , natural lighting , and passive solar heating. Fixed exterior blinds protect the windows against incident solar radiation in summer, and vertical fabric blinds enable efficient solar control aligned with user requirements. Windows not provided with fixed blinds have a Nano gel-glazing to diffuse daylight. 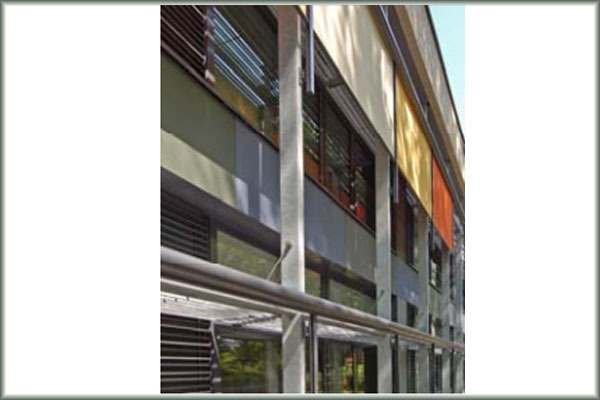 Integrated fixed solar shading and daylight guiding louvers are available for windows without shading. The concrete ceilings are left uncovered for good thermal contact and large parts of wall surfaces is covered by highly efficient broadband acoustic absorbers. A two-years intensive and a five-years long time monitoring is going to be carried out as part of the support programme EnOB (energy optimized building) of the German Federal Ministry of Economics and Technology. A micro CHP is used throughout the year to cover basic loads. A building integrated photovoltaic solar power plant of 55 kW is installed to meet the remaining primary energy demand. Combined annual primary energy production by the CHP system and the integrated PV-power plant is 24 kWh p/m2a.